The fate of the Golden Jewel board is in your hands. Rupert’s arch rival Sebastian Grenard thinks it is his family heirloom, so he decides to steal it. Rupert and his family need to find it as well as prove that the Golden Jewel board belongs with his own ancestry. Jewel Quest Heritage is played out by following a family tree that begins with his daughter Natalie and goes backwards to their early ancestors. Each section is identified by a family member’s icon that when clicked will reveal six game boards to complete. You can play boards from all characters that are currently available on screen. Game play involves three types of boards – Basic, Swap Mode and Limited Jewels. 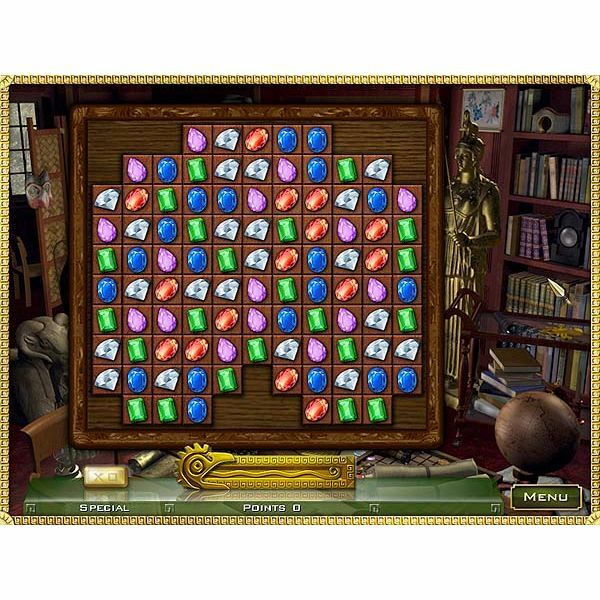 The basic game board is consistent with all other Jewel Quest games where the goal is to turn all of the tiles into gold. This is achieved by creating matches of three or more like items by swapping them in an adjacent horizontal or vertical direction. In Swap Mode and Limited Jewels the game goal is the same. However, in Swap Mode you can only swap a limited number of jewels or other icons. Alternatively, Limited Jewels boards stop adding new jewels to the board after a short amount of time has passed. Every time a game board is completed, a piece to Rupert’s family history is revealed and new characters will be revealed. Each character’s boards will increase in difficulty as you move forward in the game. 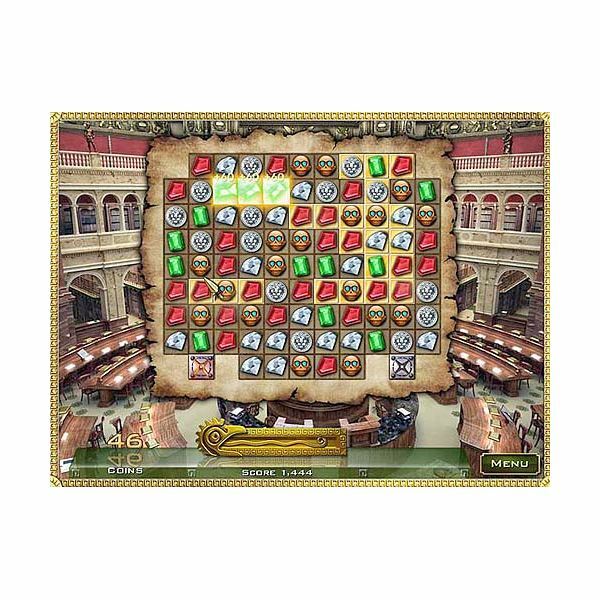 You win Jewel Quest Heritage after successfully completing all 170 game boards. Try to create matches towards the bottom at the beginning of each round. You are more likely to cause chain reactions which will result in higher points. In Swap Mode boards, always look first for potential matches of 4 or more with non gold tiles. Your next priority is matches with three that need the tile(s) changed to gold. Match three gold coins to earn “Specials" that allow you to turn a single tile into gold without having to create another match. These coins are limited, but don’t be concerned if they drop off of the board since more will appear. To help you locate tiles that are not turned into gold, press the CNTRL button and then SHIFT. The result will display the board without any jewels temporarily, making it easy to spot gaps. For extra points, to find groups of jewels where you can make “L" or “T" shaped matches. In the Yellowtail board, first turn all tiles to gold. You will then need to drop the key for both locks by creating matches that place them in the square located just above each lock. Screenshot images for the Jewel Quest Heritage game were created by Sheila Robinson.